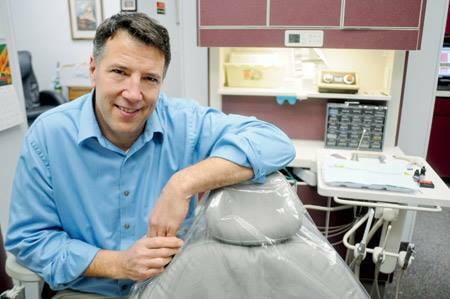 For Dr. Tom Pittaway, dentistry is more than a career. He comes from a family of dental professionals—his mother was a dental hygienist, and he was born in Germany while his father was stationed there as a dentist and orthodontist. The Pittaway family eventually settled in Calgary, Alberta, where he spent his childhood. After graduating from Gonzaga University and Washington University School of Dental Medicine, his dental career began high in the Canadian Arctic as a mobile dentist for three years. Then, he moved to Hawaii, where he practiced private and mobile dentistry for three years with brother and dentist Dr. John Pittaway. In 1993 Dr. Tom moved to Kalispell to take over a private practice from Drs. Fred Allen and Robert Orser. The practice has seen many changes since then. Dr. Tom believes his patients deserve the very best, and he makes it a priority to incorporate the latest in dental technology and science into his practice. He is the Flathead Valley’s only graduate and mentor for the world-renowned Kois Center, a dental technology leader which provides clinical education for dentists. This technology and training help his team identify and treat dental disease before you suffer the symptoms. Combining traditional remedial dental care and new technology, like laser dentistry, ensures that patients not only stay healthy, but also save money. Dr. Tom’s priority is providing comfortable and complete care to all of his patients. He and his team can find the solution for your personal situation and also help plan for a healthy future. Come experience the refreshing difference of One Dental Care Center of Kalispell. Call today for a reservation at 406-755-7117 and experience exceptional dental care. Whether you need a cleaning, porcelain veneers, straighter teeth, crowns, implants, dentures, or fillings, we can help you achieve the healthy and long lasting, good-looking smile you’ve always dreamed of. New patients and children are always welcome!